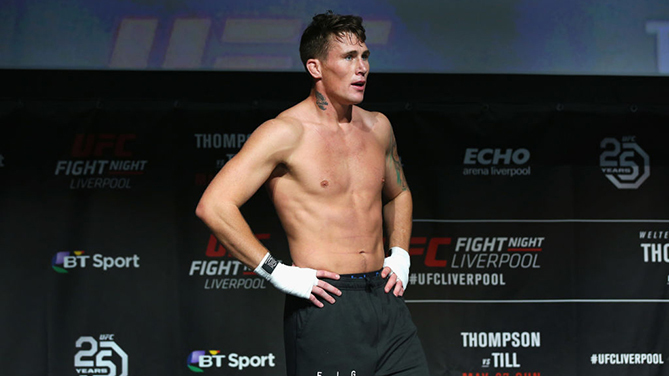 Before Darren Till soared up the welterweight ladder and into a main event slot in his hometown of Liverpool against Stephen Thompson this Sunday, there were Terry Etim, Paul Taylor, Paul Sass, Mark Scanlon and Jason Tan. All represented the city in the UFC, making it a hotbed for British MMA and a place where a dreamer could dream, as long as he or she worked hard and believed. Till was a dreamer, a believer and a doer. He was a teenager who liked to scrap and had the tools to do so on more than just a local level. And as he trained in Colin Heron’s Kaobon Gym, he watched those who were already fighting internationally for the UFC, with none more promising than Etim, who posted a 6-5 Octagon record from 2007 to 2013 that included four Submission of the Night bonuses. Till watched, and he knew he would get to the UFC. Etim will be in Till’s corner this weekend, a fitting tribute to one of the city’s MMA pioneers, and he will likely be a calming presence for the 25-year-old, who is the talk of the town before the biggest fight of his career. So what is it like for Till to be the most popular man in Liverpool at the moment? “I don’t think I’m the most popular,” he laughs. Well, top five at least. Till has earned this spot with not just hard work and sacrifice, but his performances. A 16-0-1 record leads the way, but it’s the way he’s won that made him the only choice to headline the UFC’s first visit to Liverpool. Aggressive and always in search of a finish, Till’s first headlining assignment in October was an eye opener as he blasted out perennial contender Donald Cerrone in a little over four minutes. Now, all those boasts he’s made don’t seem so outlandish anymore. That candor adds to Till’s appeal. In front of the cameras or behind the scenes, he’s just one of the lads, and while he’s gotten a lot of attention for being one of the rising stars of European MMA, none of the hype means anything when he steps into the gym to go to work. There, he has his share of days when he may wish he was back in Brazil, where he spent nearly four years. Till has earned that respect. Not just from his fellow fighters and people in the MMA business, but from his city. Remember, Till used to be the wild kid who Heron sent to Brazil to keep him out of trouble and get focused on his life and career. Today, he’s a father, a professional, and a young man about to hear a packed house at Echo Arena chant his name. That’s a life change not lost on him. The great ones never are. And while Sunday isn’t the end of Darren Till’s, he knows this night will be one he’ll never forget.